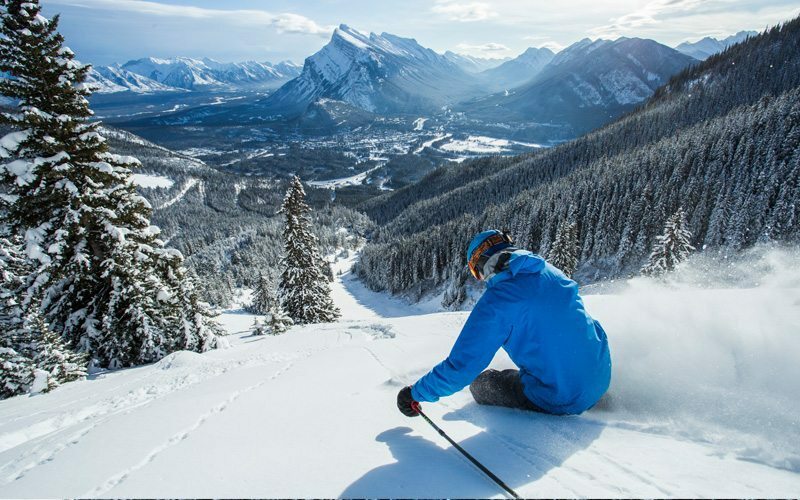 Boasting a staggering 8,000 acres of accessible terrain blanketed annually with an average of 30 feet of feather-light, dry Canadian Rockies powder, Mt Norquay, The Lake Louise Ski Resort and Sunshine Village offer skiers and riders virtually unlimited variety. 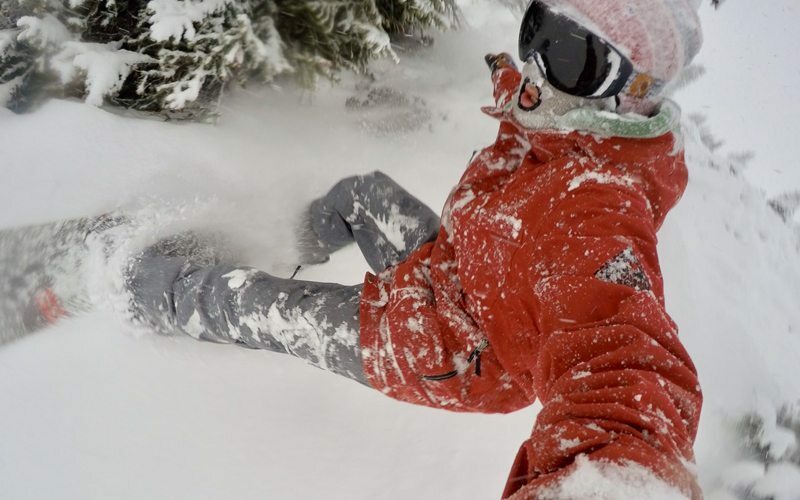 With everything from super-wide groomers and rolling cruisers, to steep and deep chutes and black diamond tree glades, there’s a run for everyone. But with 334 runs to choose from, you might be feeling spoiled for choice – so we’ve done some powder research for you! From powder newbies to seasoned experts, here are 9 of our favourite runs to hit on those spectacular powder days. 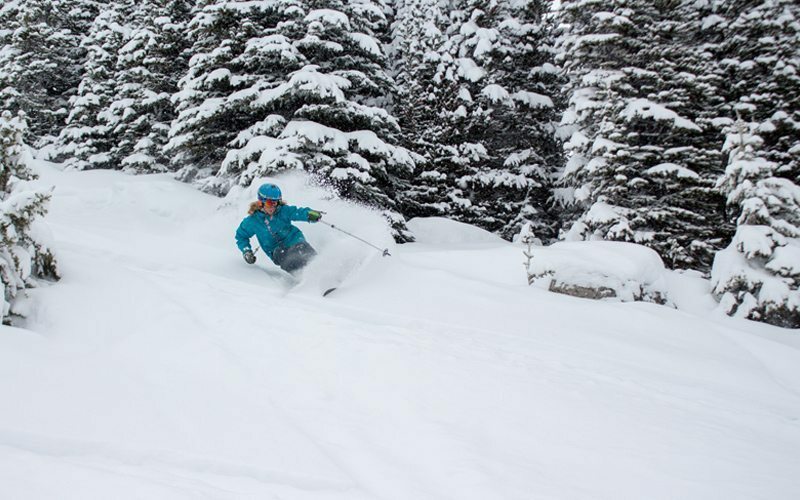 Sunshine Village powder day, November 14, 2016. If your new to shredding powder, head up Strawberry Express Quad and follow Dell Valley (#44) back towards the village. This offers a protected rolling green run back into the village, an ideal spot for beginners to perfect their powder turns. Dell Valley run on a powder day, November 14, 2016. Exit the Gondola to your right and head up Wawa Chair taking you to the top of Tin Can Alley (#60). 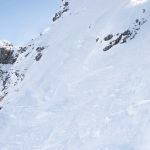 This run is great for intermediates, offering a long trail with lower ski traffic, a gradual pitch to provide momentum through the powder, and best of all, no flat spots. You’ll also find the run is lined with gladed trees so you can dip in and out of the forest for some variety. Tin Can Alley run on a powder day, November 14, 2016. Head up the new Teepee Town LX Quad, the first and only heated chairlift in Canada, to access the Teepee Town Chutes (#22) . When approaching from the top, you can start with some tree skiing to warm up your legs before heading into the main chute. When filled with a fresh dump of snow, this is a tight chute with an awesome fall line will put a smile on any pow-chaser’s face. Teepee Town Chutes run on a powder day, November 14, 2016. Head over to Spirit Chair via Constellation (#23). This beginner run has plenty of space for you to spread out and perfect your powder turns. Spend the rest of your day taking your pick of the multiple green runs available in this beginner pow-friendly zone. New this year are the Norquay 90 Glades (#51), off the Mystic Chair. Perfectly spaced trees socked in with fresh dump of snow is a recipe for a memorable powder-day. 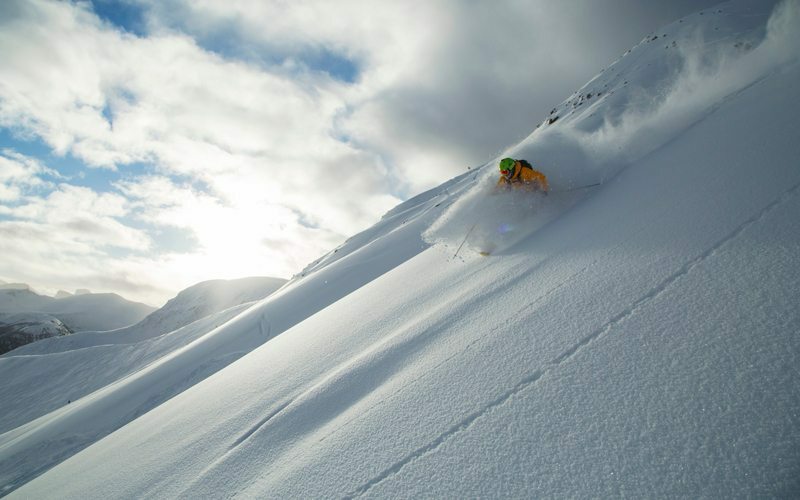 Here you’re sure to find a plethora of untouched, hidden powder stashes that not even the locals have yet discovered. 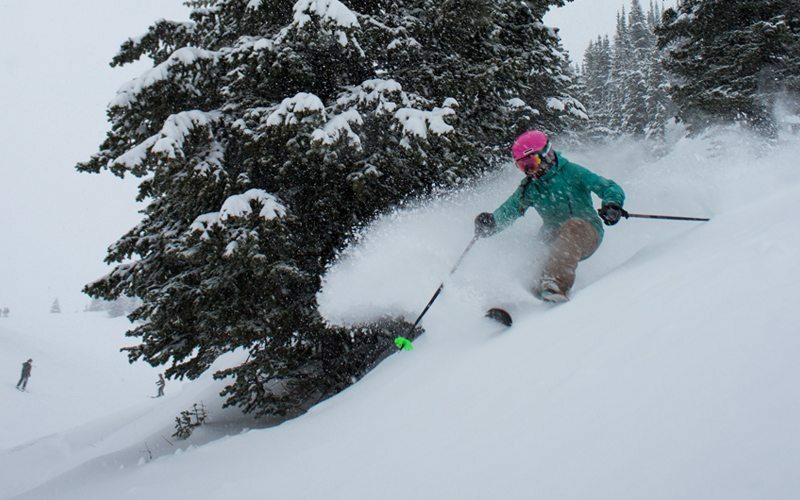 There’s nothing better than a full-on powder day lapping the North American Chair. Renowned for its steep slope, this chairlift offers unlimited line choices and unmatched face-shot potential. 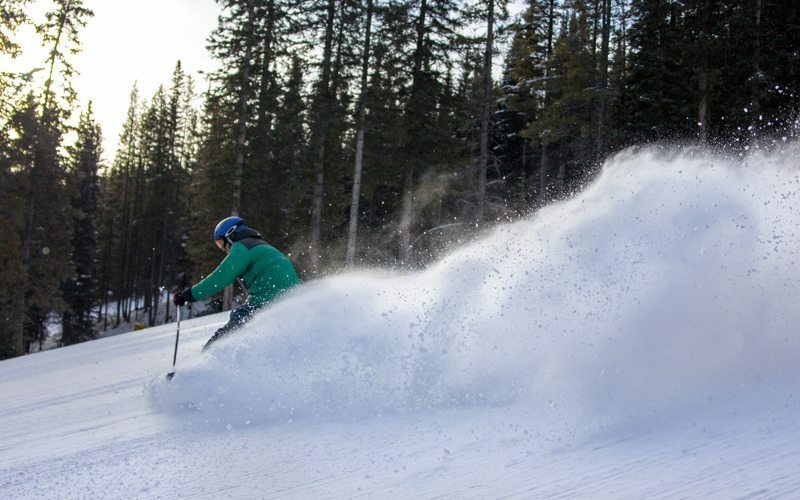 On a powder day when the snow fills up this mogul face, Lone Pine (#3) is the stuff of legends. If you’re a beginner on a powder day and all your friends are heading to the back bowls, fear not! You can join them by heading up the Top of the World Express and skiing down Saddleback (#109) into the renowned backside bowls of Lake Louise. This long, cruisy run gives you all the pleasure of a back-side experience with the safety of a green trail down. Head up the six-seater Top of the World Express and choose Sunset Terrace (#23) on the front side of the resort. Here you’ll find spectacular views across the valley towards Lake Louise. 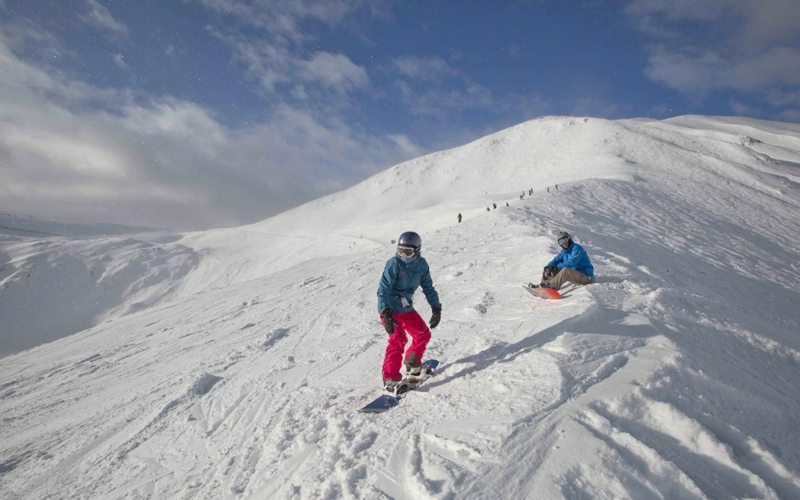 Pick you line down this intermediate run – you can choose the main track, or venture into one of the wide-open bowls. On a powder day, look back up and admire your perfect figure 8 tracks down this open slope. Head to the top of the Summit Platter and dip over into the Back Side. Here you can access some of the most exhilarating powder chutes and epic terrain available across all of Lake Louise’s 4,200 acres. 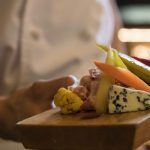 Head into ‘E’ Gully (#128) and you’ll reap some serious kudos at après. Ready for your next adventure? Which runs will you choose? Glad to hear you found the post useful Jody, hope to see you soon! Here’s to a great winter! What is the highest elevation that the intermediate/expert trails start at ? We are headed your way soon for the first time and this post gave us a lot of useful info. Thanks. Thank you for your lovely feedback, François! We are so pleased to hear that this post was useful to you. We hope you have a wonderful adventure here! Happy holidays! My wife and I are heading north from Seattle in less than a couple of weeks and we’re going to be staying in Banff and skiing Lake Louise and Sunshine Village for our first time. We were hoping to get a local’s opinion of where we should ski the most and what the differences are between the two. We love steep groomers and powder skiing and do not care for moguls anymore. 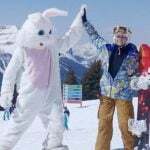 We have 6 days to ski and the only thing I’ve heard is that if it’s windy we should go to Lake Louise instead of Sunshine Village because it is so exposed to the wind. Also, should we ski Norquay one of the days? Hi Joel, congratulations on your upcoming adventure in Banff National Park! 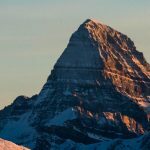 All three ski resorts here are excellent for different reasons and we would highly recommend skiing all of them if you can with our tri-area lift ticket. 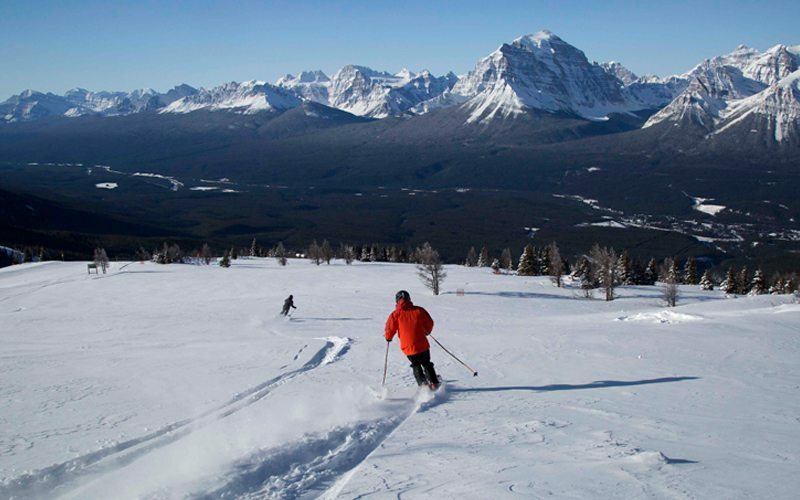 Lake Louise and Sunshine Village offer the most amount of diverse terrain as they are larger resorts. 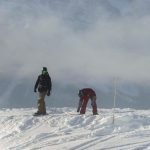 At Sunshine Village, there are a lot of options for steep groomers from Goat’s Eye Express as well as the Divide Chair. 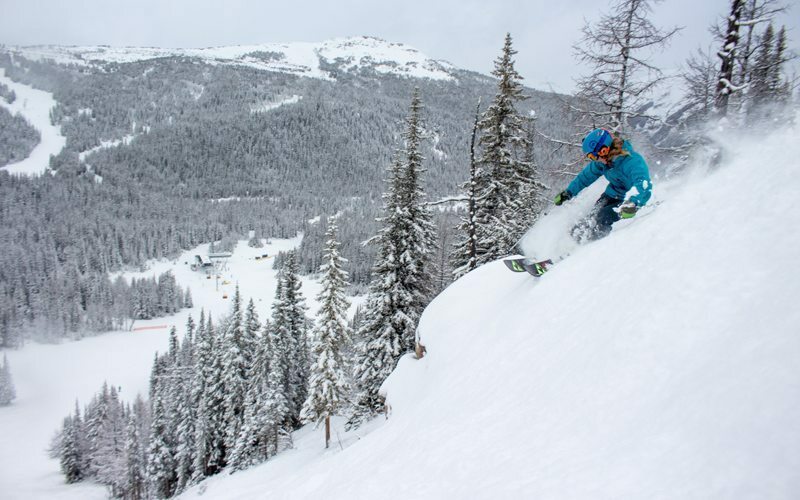 At Lake Louise, the Front Side offers some great options – runs that you might want to check out include Meadowlark and Women’s and Men’s Downhill. 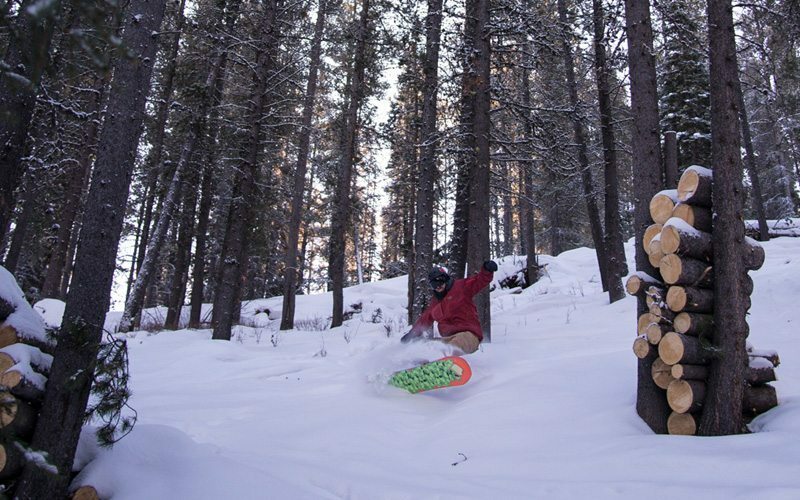 Mt Norquay is a smaller resort which prides itself on its grooming, and you’ll find great options from the Mystic Chair. The ideal time to get there is first thing in the morning to take advantage of that perfect corduroy. 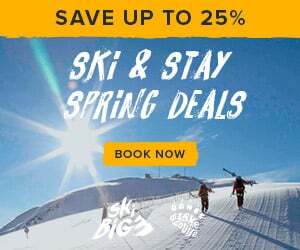 We hope you and your wife have an amazing ski trip – you’ll definitely find lots of variety! Sorry Bonnie I meant you and not “Rita”. Hi Gregg, thanks for your comment! I will have a chat with the team about which easier black runs they would recommend and get back to you ASAP. Please let me know if I can assist further in any way at all. I hope you have a wonderful visit to Banff! 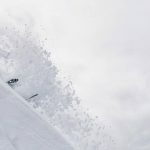 Hi Gregg, just an update further to my previous comment: more approachable options that we would recommend at each resort would be black diamond runs rather than double black diamonds, and ones that have been freshly groomed. Each day you can find out which runs have been groomed via the Trail Grooming Reports. For some specific examples: at Sunshine Village, “Bye Bye Bowl” (33) is a black diamond that is not super steep. At Lake Louise Ski Resort, “Meadowlark” (#59) is a good black diamond, especially with fresh snow. At Mt Norquay, try “Giver Grandi” (#42), another black diamond that is not super steep. I skied all these Areas for many years. I am a male, 89 years old and still enjoy my favourite Sport. I can handle almost any type of terrain but when the Light is flat, I have problems. I have macular degeneration and this makes me more careful. Old Age should not be a deterrent, but everybody has to know their Limits and ski sensible and in Control.